Training isn’t enough. You need some teaching too. Training means you can drive a car. Teaching will educate you on how a car works, the costs of ownership and history of transport. In IT, training may be bought but teaching comes from the people around you and from your own unstructured study. Your education program should include both. Teaching focusses on fundamental knowledge plus support for your emotional and personal needs. Both teaching and training have their place. 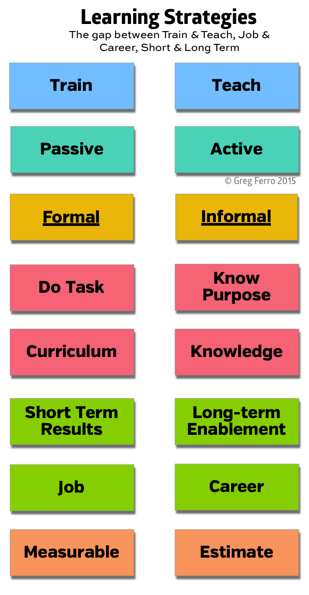 Training tends to short term, job-centric, task focused. 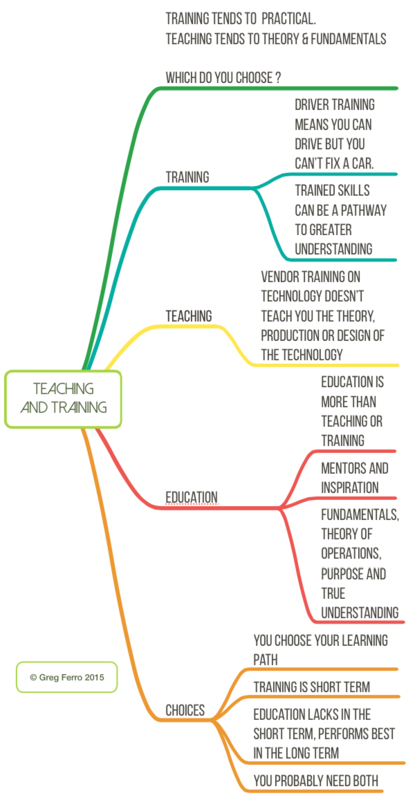 Teaching tends to long-term, career enhancing and knowledge-centric. Find teachers in the workplace, in blogs/podcasts, in user groups. Education is a combination of training and teaching. And probably a lot of other things too. 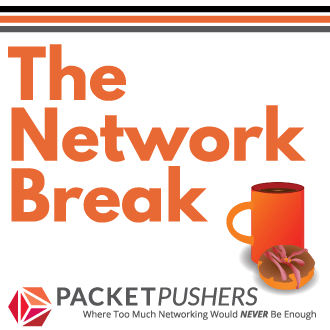 Pull the lever, load the truck this way because it works best and configure the router with these commands. Write a script, its does a thing. These are examples of training. You can train to drive a car, forklift or fly a plane. You haven’t learned how a car operates or how a plane flies. You can be trained to configure a Netscaler load balancer, Juniper router or Fortinet firewall but you won’t learn the theory of load balancing, routing or security. The role of the teachers has two parts – education and learning. Education is teaching the fundamentals. Calculus & English grammar taught in high school are good examples. Or learning about graph theory (that OSPF uses to calculate the best path). Learning is about you, the person. Personal and emotional growth is equally important. In the corporate workplace, learning is about respect, teamwork, process, timely reports and prompt timesheets. And its about emotional hygiene towards your colleagues who you are forced to get along with. Most people see “teaching as education” when you attend an institution or a programs and, in practice, is mass-production of teaching. A factory can weave cloth in large volume & at faster speed compared to hand-powered loom to produce low cost cloth at predictable quality. Teaching means understanding the difference between a program and a script. Or learning protocols to perform best possible load balancing or firewalls. An institution (university, vendor) can teach or train at lower unit costs and predictable quality – in effect, a mass production of education. But commercial interests mean vendors focus on training for short term results. You need training and teaching. Training is often passively sitting the classroom while a “trainer” spouts hours of slides at you. Working with a teacher is actively engaging and having discussions. Training teaches how to complete tasks, teaching understand the purpose of the task as well. Training uses a curriculum, teachers share knowledge. Training gives short term results by improving task completion or providing skill competency. Teaching gives you life long enablement to keep learning more. Training helps you to complete the job. Teaching will enable your entire career. Training lends itself to measurement while teaching doesn’t. You can “get” teaching by taking control of your life and reaching out. You can “find” teaching if you look for it. Conferences – although conferences are expensive and time consuming, the personal face-to-face time is a very intense learning experience. Meetups and Local Events – look around for local community groups that talk technology. Some IT professionals receive training from employers. Often this fills the gap when people haven’t been to university/college to be taught core computing skills such as programming or computing theory. Training can deliver short term results. It can also be a a step along a path to greater skills and mastery. Learning is about competing with yourself. and you have to make your own decisions. I would suggest that you choose both. Get training for short term results when you need them. But look for teaching opportunities that will sustain your career in the long term but participating with others. Build an education by combining many things. 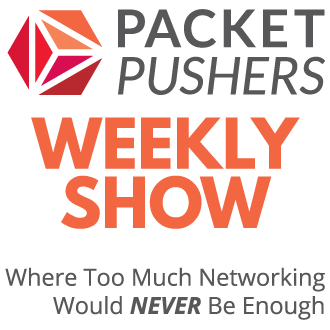 Podcasts, blogs, social events, meetups, meetings, project reviews, ………. Great. This topic is not discussed often enough.